This pay desk almost certainly came from the second Wolverton Station (1840-82) which was situated near to where Electrolux is today, alongside McConnell Drive. This is the station that contained the well-known Refreshment Room. The station was moved to Stratford Road above the rerouted line in 1992. 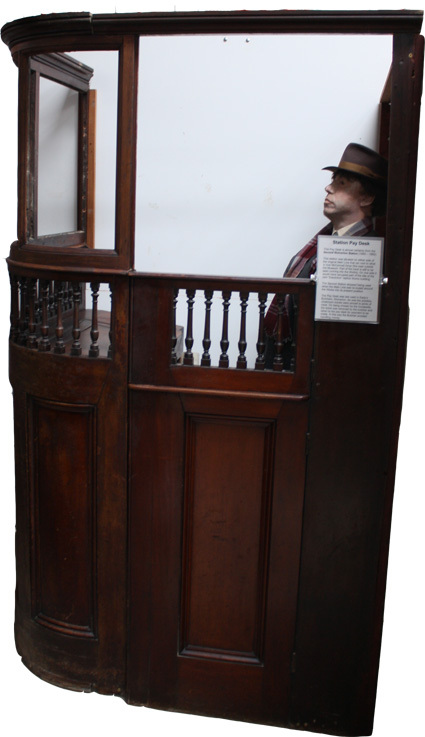 This pay desk was last used in Eady’s butcher’s shop in Church Street. In those days cloakroom tickets were pinned to meat and, on being chosen by the customer, the ticket was removed by the butcher and taken by the customer to the pay desk for payment. This meant that the butcher, with his bloodied hands, never had to handle money. Late Grandmother used to visit them and became vegetarian as she didnt like it when they had to slaughter lambs in the back yard.